I'm just sick tonight. My babies start school tomorrow. I thought I was looking forward to sending them off. Let someone else listen to them fight all day. Except at school they are each other's best friend and have each other's back 99.3% of the time. They do most everything the teacher asks. They work hard. They are attentive. They are compassionate. They compete to be the best behaved. They save all their bad behavior for me. My mom says it is because they know I'll love them no matter what and they aren't sure about the rest of the world. I don't know. Hubs says I'll be really pathetic when Charming starts school if I'm freaking out about Frodo. Except is isn't just Frodo that is getting to me. It is the teddy bear that Eldest earned in Kindergarten that is choking me up from the living room floor. And he's growing up so fast and is such a great helper with Charming. It is that all three can now tie their shoes (we did that Friday when I decided seven is old enough to be ridiculous and Frodo just learned along with them). It's those big puppy paws of his. When he came out, we thought he'd weigh more than he did, because his hands and feet were huge. He was 24 inches long, that 9lb 4oz boy. 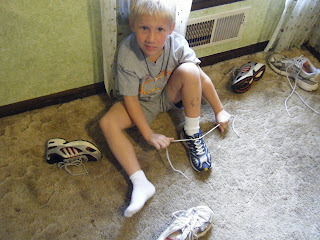 And now he can tie shoes onto his big feet. And there's Princess that I'm sending back into that den of boys. She likes me. She wants to spend time with me. She isn't embarrassed by me. That's gonna last, what, couple more years. And she is missing her two front teeth as of Friday. Oh, how she made me laugh today. Several times. We were singing this song in church this morning that was "worthy, worthy, worthy" and she turns to me and whispers, "it sounds like she's saying whirly, twirly, swirly." She was right. And this afternoon, on a 20 minute ride, she memorized her 3 times table. So my stomach is flipping around like I'm about to give a speech in front of the HHS student body for Stuco elections. And I think I might collapse into the ugly cry any minute. It's the birthday that does it to me now (growing up pains). School doesn't. Okay, school does just not as much. Of course I've done the ugly cry at the school. Before watching his first Upward game (and when they ran through the tunnel for the last game). The ugly cry is just below the surface a lot of the time.